LOOKING FOR THE MOST UNCONVENTIONAL SUPERHERO HERB GRINDER? 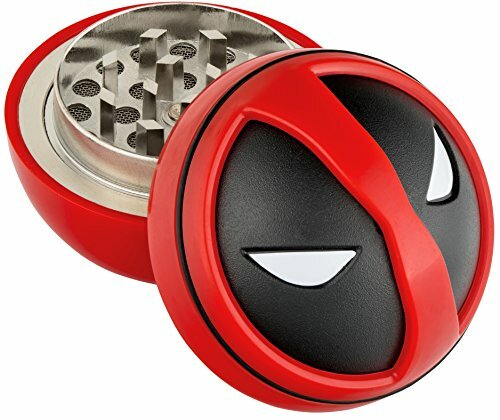 Our popular Deadpool premium weed grinders is here to help your fine grind your favorite herbs, spices or tobacco, and do it with an attitude! Just like the rea cooll Deadpool! SURPRISE YOUR LOVED ONES WITH A SUPER-FUN DEADPOOL GIFT! Are your loved ones huge Deadpool fans? Now you can spoil them with our stainless steel natural herbs mill and offer them a unique birthday, holiday, Christmasor graduation present! SUPERIOR-QUALITY STAINLESS STEEL DESIGN FOR ALL HERBS & SPICES! Our stunning Deadpool dry/fresh weeds grinder is well-made and features a practical kief collector, so all you have to do is collect the finely ground tobacco and enjoy it like never before! FINALLY, HERE\'S A SPICE CRUSHER THAT CAN ENDURE ANY ABUSE! Just like Deadpool, our ergonomic and sturdy magnetic lid weed and spices grinder will pass the test of time, overcome any adversity and help you grinding your favorite herbs for along time! 100% SATISFACTION OR YOUR MONEY BACK! That\'s our unconditional guarantee! If you\'re not 100% thrilled with your high quality novelty superhero herbs grinder, we promise to offer you a full refund! And Deadpool always keeps his promises! Excellent collectible item for "Deadpool" fans!